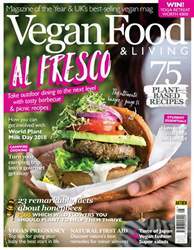 Digital Subscriptions > Vegan Food & Living Magazine > Aug-18 > What can HERBS do for us? Herbs are used to add fragrance to our food, our homes and our beauty products, but it’s not just their fragrance that makes us love them! Almost all societies have traditionally used herbs for their amazing nutritional benefits as well as their therapeutic powers. An anti-inflammatory powerhouse, used in everything from skin care to weight-loss and even arthritis support. The bright yellow colour indicates that turmeric is rich in antioxidants, helping cells to fight damage. It is best used in cooking and in combination with other digestive spices, such as ginger, black pepper, cumin or fennel. If you have fresh turmeric root, then add 1-2cm (½-1in) to a freshly made vegetable or fruit juice. Be aware that with turmeric, as well as some other kitchen herbs, high amounts might disagree with some digestive systems. High amounts are not required unless advised by your herbalist. Be careful when juicing or cooking with turmeric as it leaves hard-to-remove stains.